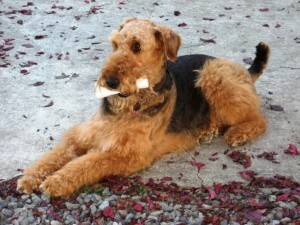 Buddy is a happy, healthy, boisterous four year old Airedale with an enthusiastic character to match his size. He probably weighs around 90lbs. 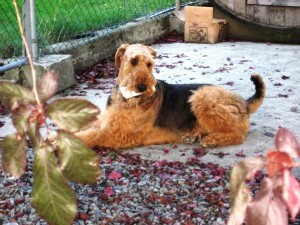 We think his energetic nature and positive temper would undoubtedly respond well to obedience classes. He is vivacious and eager to please and very curious about the world around him. He is protective of his home and family. He is a good-natured fellow, though his energy level means an adult oriented home with a large yard or in a rural setting would be ideal. He would probably do well with teens who have previous experience with dogs. Buddy has been well cared for which shows in his immaculate coat and happy expression. He has been neutered. He is easy to groom and will prance proudly after a bath and brush. Buddy has learned to sit, stay and come, though he would enjoy a home that would help him practice more often and teach him new tricks. As Buddy is very smart, there is no doubt he would learn quickly. His strong appetite should make him easy to train with treat motivation. A home with cats or other small pets would not be suitable for Buddy. we know Buddy’s brother Raffa … he lives in Osoyoos! he still needs one. Is he still available, I’m interested. To save time, we often indicate a dog has been adopted without rewriting his blog entry. Buddy is indeed in a new home. Thank you for your interest.